Meanwhile, Milne emphasized that his company's financial condition is sound. It continues to buy back stock, having repurchased 41.6 million shares for $59.3 million last year. It will make a $50 million debt payment in 2008, but doesn't have another due until 2012. And it ended last year with $180 million in cash. (Last year, Ryland also lowered its credit line to $750 million from $1.1 billion.) Ryland owns about three-quarters of its 40,000 lots, and Milne said the company wants to get that down to 50 percent owned. At the same time, it continues to reduce its exposure to land options. The one area from the recent boom that Ryland misses, said Milne, is the disappearance of Alt-A mortgages, which in 2005 accounted for 17 percent of the loans its mortgage subsidiary wrote. By the end of last year, Alt-A and subprime loans accounted for zero percent of Ryland Mortgage's business. "Alt-A was a big loss," said Milne. Centex chairman and CEO Tim Eller outlined the six elements of a market trough this morning to kick off the Wachovia Home Building and Building Products Conference in Las Vegas. Eller said that the six elements of a trough are when foreclosures rise, the economy slows, housing starts fall precipitously, the new home market corrects much faster than the existing market, land prices begin to soften, and home builders with liquidity begin to re-invest. Moving forward, Eller said Centex is focused on streamlining its processes and operations. He said the company went from 4,500 floor plans at the peak of the boom and is now down to 700, with plans to reduce plans even more. He said Centex will focus on "A" locations nationally and stay away from the fringe housing markets. "The 'A' locations will always prevail," he said. Eller said the company had 44 divisions at the peak and is down to 35 today and will be down to about 30 by the company's next fiscal year. For example, in the Southern California, Centex went from five divisions down to one centered in the Inland Empire. The company also plans to maintain a more flexible land position, going "shorter" on owned properties and "longer" on options as the market matures. A trimmed-down, reorganized Beazer Homes may be headed for further alterations as the troubled, Atlanta-based homebuilder tries to reinvent itself in the worst housing market in decades. Over the past year, Beazer has cut its workforce in half, withdrawn from the mortgage business, reduced its land holdings, eliminated some $50 million in materials costs and withdrawn from five metro housing markets across the country. "We are trimming our land wherever we can. And obviously we are not developing beyond the sales pace that we need today," McCarthy said. In the weeks ahead, McCarthy said the company may reduce its activity in its 40 remaining markets scattered across 19 states by examining market data to determine which of its four product categories are best suited for each market. In addition to the slow pace of home sales, Beazer is facing two federal investigations into its mortgage lending practices and a collection of lawsuits from buyers, stockholders and pension plan participants. The troubles began with reports last year about high foreclosure rates in Beazer neighborhoods in the Charlotte, N.C., area. McCarthy said the company is working to resolve its legal challenges and putting measures in place to prevent any similar problems from arising in the future, including the appointment of an internal compliance officer and implementation of a new companywide ethics policy. Calling the current housing correction as dramatic and rapid as those of the mid-1970s and the early1980s, Hovnanian said each of those downturns shared an important similarity-a rebound that was as sharp and as fast as the fall-off, with sales and prices rising significantly within 12 to 24 months. One notable difference between the earlier downturns and the current one, Hovnanian said, is the interest rate. In the early 1980s, they peaked above 18 percent. Today, they're below 6 percent and predicted to go even lower. That will work in the industry's favor as the market begins to turn around. As you know, housing starts have been sliding like kids in the playground, with the January figure down 27.9% from the revised January 2007 rate. On Tuesday, Standard & Poor's announced -- in a release that became a Wall Street Journal lead article the following day -- that, according to its S&P/Case-Shiller indices, U.S. home prices dropped by a sobering 8.9% in the final quarter of 2007. California-based RealtyTrac said earlier in the week that the number of homes facing foreclosure jumped 57% in January from the year-earlier month. According to the National Association of Realtors, sales of existing homes slid to a nine-year low in January. You'll notice that this item and the two preceding it can only serve to inflate the already sizable inventory of homes available for sale across the nation. Not to be outdone by the existing homes set, the Commerce Department said that new home sales dropped in January to the slowest rate in nearly 13 years. The Conference Board said Wednesday that the Consumer Confidence Index, which has a direct bearing on home sales, fell to 75 in February, from 87.3 in January. But Fools, not all the housing news is on the negative side. Mercifully, the ceiling on conforming loans for Freddie Mac (NYSE: FRE) and Fannie Mae (NYSE: FNM) will be raised in the not-to-distant future from $417,000 to nearly $730,000. I've long felt that such a step would help housing recover at the top end, a trend that could then filter down to lower levels. And Wednesday, closely watched luxury homebuilder Toll Brothers (NYSE: TOL) told us that its latest quarter had resulted in a loss of $96 million, or $0.61 a share, compared to a $0.33-per-share profit a year earlier. But without $245.5 in pre-tax write-downs, Toll said it would have earned $0.35 a share in its latest quarter. Clearly, the few rays of improving news about the sector tend to evaporate in the presence of the bad news. But keep in mind that economic signs point to a U.S. recession; energy prices show few indications of retreating; mortgage lending remains unsettled; and the consumer, as is indicated above, is feeling under the weather. Further, any moratorium on foreclosures would be disastrous for the homebuilding sector. While such a proposal remains on the table, it should give all investors pause. So Fools, nibble away at the builders if you must. Just be sure you're working with a longer-than-normal investment time horizon, and that you stick to the companies with the strongest track records and the most robust balance sheets. New-home sales took their third tumble in a row during January, sinking to the lowest point since early 1995. Sales of single-family homes decreased by 2.8% last month to a seasonally adjusted annual rate of 588,000, the Commerce Department said Wednesday. December new-home sales fell 4.0% to an annual rate to 605,000; originally, the government said December sales fell by 4.7% to 604,000. Sales declined 13.1% in November. Economists forecast January sales at an annual rate of 600,000. The level of 588,000 was the lowest since February 1995's 559,000. Year over year, new-home sales were 33.9% lower than the level in January 2007. The median price of a new home decreased by 15.1% to $216,000 in January from $254,400 in January 2007. The average price decreased by 12.1% to $276,600 from $314,600 a year earlier. In December last year, the median price was $225,600 and the average was $274,700. Regionally last month, new-home sales decreased 2.4% in the South, 7.6% in the Midwest, and 10.3% in the Northeast. Sales rose 2.2% in the West. In recent years, home lending has boomed. But standards loosened at many mortgage firms and led to a rise of abuses, in particular predatory practices. Now, record numbers of people are finding themselves with loans that are more than they can afford and many want out. Estimates vary widely on the number of homeowners who could benefit from the case. Those who have refinanced or hold a home equity loan are already eligible for a refund, while others can get monetary damages. The court's ruling won't change this. But by allowing plaintiffs to file class-action suits, the ruling would make it much easier and more affordable for groups of homeowners to get that relief, several lawyers and mortgage analysts said. The law states that even a minuscule violation by a lender can lead to a mortgage cancellation, or rescission. For example, if the annual percentage rate calculation is off by one-eighth of a percent between preliminary and final loan documents or if a monthly payment schedule does not conform precisely to federal guidelines, some borrowers could get a refund for all they have paid to live in their homes for years. They would have to pay back the entire amount of the loan, but they could then seek a new mortgage on better terms. According to the inspector general for the Federal Deposit Insurance Corp., 83 percent of federally supervised banks that issued loans at the height of the housing boom in 2005 have been cited for "significant compliance violations." Lending abuses were more frequent among the tens of thousands of state-regulated banks and thrifts, such as the now-bankrupt New Century Financial, industry analysts said. But few homeowners have been successful in getting their loans canceled. Most people are unaware they have this right, consumer advocates said. Others have found the process too arduous and expensive, often requiring long legal battles. Chevy Chase said it negotiated two mortgage cancellations all of last year. Wall Street banks are also worried. In many cases, the cost of reimbursement falls not on the mortgage lender but on the financial institutions that later bought and securitized the loans. Standard & Poor's/Case-Shiller indexes do not adequately reflect U.S. home prices, mainly because the monthly reports are based on repeat sales and exclude new development, said Jonathan Miller, executive vice president and director of research for Radar Logic. "The basic premise is flawed," Miller, speaking at the Reuters Housing Summit, said of the Case-Shiller indexes. S&P-Case/Shiller produces a closely watched monthly index as well as a quarterly gauge of home prices in the top 10 and top 20 metro areas. Using a repeat sales method, the home price change of a house sold now would compare with the last time it was sold, which could be years ago, Miller said. "When you do a repeat sales index, you exclude all new development because there was no prior sale," Miller added. "They also exclude condominiums, so you are covering the New York City market, and you're not including condominiums, yet you're representing that that's the New York number." The biggest problem with excluding new development, he said, is that it influences prices of existing properties in that market. The Case-Shiller indices are a "great concept if you are measuring existing housing sales in suburbia," Miller said. "It's a very academic approach, and it's technically correct. However, it doesn't represent the actual cities that are being covered accurately, in our opinion." David Blitzer, managing director and chairman of the Index Committee at Standard & Poor's, countered that the repeat sales method captures the broadest swath of the housing market and provides a uniform source of comparison. "To combine new homes and existing homes in a single index is a mistake because it's a different phenomenon, a different kind of animal," he told Reuters in a telephone interview. "The existing homes are the bigger and the more important segment" of the housing market, he added. Sales of existing homes roughly outnumber sales of new houses by at least five to one, Blitzer said. And that is true -- on a national scale. But what about specific markets like California's Inland Empire where the ratio of new-to-existing home sales is higher? In the case of S&P/Case-Shiller it doesn't matter because they don't track the IE separately. So how is Radar Logic different? Radar Logic is a data and analytics business based in New York that produces a daily "spot" price for residential real estate in major U.S. metropolitan areas. It tracks housing markets by publishing daily the price per square foot in 25 metro areas, Miller said. That compares with the Case-Shiller indexes, which are publishing once a month using a 90-day moving average, he added. "The reason these indexes are being created," Miller said "is to enable trading of financial instruments on Wall Street. You want to reflect subtle changes in markets, and it's very difficult to do that if you're doing a 90-day moving average and giving 12 data points a year." Another shortfall is that Case-Shiller "doesn't factor in remodeling, expansion of footprint, which has been a very significant trend in housing, especially over the housing boom," Miller said. Expect more on this "battle of the indices" to come. There seem to be two distinct schools of thought regarding declines in home prices. The first one -- generally held by people who own homes and don't want to lose equity or those underwater and so can't refinance -- claims that it's nothing less than a disaster. The other one -- more typically held by renters waiting to jump into a lower-priced market and many economists -- is that this is a necessary consequence of the boom, and is a good thing as long as it's somewhat orderly, although renters chomping at the bit to buy bargains want the decline to occur as quickly as possible. Those renters may be getting their wish. According to several different indices, the decline in home prices appears to be accelerating, both in the boom markets and at the national level. The decline in residential real estate accelerated though the end of 2007, and home prices in 20 key markets plunged 9.1% for the year, according to a survey released Tuesday. The licensing agreement with Bear Stearns is part of an initiative by Standard & Poor's to help facilitate the development of an over-the-counter market for derivatives based on the Indices, and is in line with the recent announcement of Standard & Poor's acquiring exclusive rights to the S&P/Case-Shiller Home Price Indices, Standard & Poor's said in a statement. "The S&P/Case-Shiller Indices were created specifically for settlement of financial contracts," Robert Shakotko, Managing Director at Standard & Poor's Index Services, said in the statement. "This licensing agreement is a first step towards working with more dealers to create an OTC market for trading on these Indices," he said. U.S. home prices in the last quarter of 2007 fell 1.3%, a record drop, a new government report shows. The survey, by the Office of Federal Housing Enterprise Oversight, also reveals a stubborn strength in most of the nation's local markets, a stability obscured by the national figures and one that is frequently overlooked in discussions of the dire shape of the housing market. "The states suffering the most are on the coasts," says OFHEO chief economist Patrick Lawler. The 291-city report finds widespread declines, but the worst pain is found in California, where homes on average lost 6.7% of their value over the year; Florida, where homes prices declined 4.7%; and the desert Southwest, where overbuilt Arizona and Nevada continue to writhe. Despite the drama in those places, though, prices in most of the rest of the country held up relatively well, losing less than 2% or even, in a few places, growing. The stability is found in the middle of the country, which never saw the stunning boom-year price increases that now are unraveling in former boom markets like Florida, California, Arizona and Nevada. In eight states, house prices rose year over year: Utah, 9.3%; Wyoming, 8.3%; North Dakota, 7.8%; Montana, 6.9%; Texas, 6.2%; New Mexico, 5.4%; Washington, 5.4%; and Oklahoma, 5.1%. So what about other indices? Prices. The National Association of Realtors' report on fourth-quarter 2007 home prices (.pdf file) shows the median home price dropped to $206,200, down 5.8% from $219,000 the year before. More than half of the 150 cities tracked had falling prices compared with a year earlier. The latest S&P/Case-Shiller index shows prices plunging 7.7% year over year in the 20 cities tracked. Although it follows only a handful of cities, trend-watching economists favor this study because it includes all home sales, not just, as with OFHEO, those eligible for government mortgage insurance. Zillow, an online home-valuation company, reported single-family homes losing 5.5% of their value from the previous year in the fourth quarter; condominium prices dropped 7.4% in the fourth quarter. Inventory. In January, the backlog of existing homes for sale rose to 10.3 months, meaning that it would take that long to sell all of them at the current pace. (When supply and demand are balanced, inventories are at five or six months; the boom created inventories as low as three months' worth). That's considerably worse than December's 9.6-month supply and 53.7% more than at the same time last year, according to the National Association of Realtors. There's also a 9.6-month inventory of new homes on the market, 54.8% more than the year before, according to Census Bureau estimates. Foreclosed homes coming onto the market contribute to the swollen inventories. Foreclosures. Foreclosure filings -- including default notices, auction sale notices and bank repossessions -- continue to grow. In January, foreclosures grew by 8% from the previous month and 57% from the year before, according to RealtyTrac. Home-builder confidence. The National Association of Home Builders/Wells Fargo Housing Market Index takes the pulse of construction professionals every month. A number over 50 indicates their optimism for the new-home market. The index stands at 20 in February -- a bit better than a historic low, 18, in October and November, but 20 points lower than a year ago. The NAHB says members are cautiously optimistic because of slightly increased numbers of people touring model homes. Delinquencies.In the third quarter of 2007, 5.59% of mortgages (not including foreclosures) had late payments. It's the highest delinquency rate since the Mortgage Bankers Association report began 22 years ago and an increase of 0.92% from the same time in 2006. Housing starts. Builders began work on about a million new homes in January, slightly fewer than December and 27.9% fewer than the same time last year, according to the Census Bureau. "Eventually, such a huge drop in production will reduce inventory and allow the market to stabilize, but for now it's just pain, pain, pain," wrote Ian Shepherdson, chief economist for High Frequency Economics, in a recent newsletter. So where is the pain most focused? California alone has as many new foreclosures from subprime ARMs as 35 other states combined. And even in California, it's the overbuilt markets (such as San Diego, Stockton, Sacramento, Bakersfield, Chico and Fresno) that are seeing collapse while others are fairly stable. The worst trouble is concentrated in California and Florida, where overbuilding and speculation drove prices beyond the reach of most buyers, and Ohio and Michigan, where failing local economies, job losses and shrinking populations mean there are more houses for sale than buyers. All states are caught, to some extent, in the downdraft of these imploding markets. Yet homeowners should be unaffected if they have traditional fixed-rate loans and can stay in their homes until things turn around. Experts worry not so much that home prices are falling -- on the coasts they've still got far to go before reaching affordability -- but that they are falling too fast, helping pull the rest of the economy down. "There's nothing troubling about a gradual correction of home prices," Yale University economist and Case-Shiller index founder Robert Shiller told an audience at the Reuters Housing Summit recently. "If we keep our incomes at the current level and home prices go down, we are richer, we can buy more housing." However, he said, "if they fall suddenly and fast, then that can bring on recession, and that is the worry right now." To gauge whether that is happening, Celia Chen, director of housing economics for Moody's Economy.com, will be watching several key economic indicators, particularly those listed above. "I think the key to a turnaround in home prices is that the mortgage markets do regain some semblance of stability within the next year. Given the fact that the credit quality problems are spreading beyond mortgages into student loans, auto loans and credit cards, there are risks that conditions in financial markets could be worse than we are anticipating and would delay the turnaround further," Chen says. Delinquency rates will need to shrink for several months to signal that the worst is over, she says, and home builders' confidence will have to rise for three or four months. She's also keeping a close eye on inventories -- a seven-month supply would demonstrate a turnaround beginning, and a six-month supply would indicate strong growth, she says. Because of the national economic instability, analysts say that it's particularly hard to predict when a turnaround will happen. The effect of a recent congressional stimulus, meant to pump money into housing markets by temporarily raising the limits on government-backed loans in higher-priced cities, is likely to be limited, analysts say. "The greatest increase in eligible transactions apparently will be on the West Coast," says Feder. Only 15 U.S. counties have median prices high enough to qualify, according to MarketWatch. "We expect that home prices will bottom by mid-2009," Chen says. "I think by 2010 we'll see healthier price gains -- certainly nothing like we did over the last six years, but they probably reach about 4% price growth by 2010 or 2011." Wharton economist Jeremy Siegel, the author of "The Future for Investors: Why the Tried and the True Triumph Over the Bold and the New," predicts the economy will start improving in the middle of this year but home prices will keep falling until demand catches up with the vast oversupply. "I think they (prices) will stop dropping by the end of the year or early next year and then will remain stagnant for several years after that," Siegel says. "We won't have a general rise of home prices for a while." Morgan Stanley analysts give sliding prices another three years. When real estate does finally awake, it will be to a much-changed world. Credit, at least for a time, will be much tighter. That will keep many people from participating in the housing market. Also, people holding off selling now will jump in when things improve. And the most important thing of all? Buyer psychology. It prompted the last boom and then it turned on a dime. We won't see an extended rebound in housing until the national mood rebounds as well. "I think there are a lot of people holding off their sales because they know the market's bad, and as soon as they hear there are rising prices, they'll put their homes on the market and that (influx of homes for sale) will keep a lid on prices," says Siegel. "That's one reason I think the market's going to remain stagnant for a while. A lot of people will say, 'All right, I can finally get out.' and they're going to dump." The last places to recover, analysts say, will be markets that inflated most during the boom, like Miami, Phoenix, Las Vegas and San Diego. "As soon as everybody believes that the housing market will never turn around, just when it looks like we're doomed -- that's when it rebounds," says Hughes. The strongest markets were smaller towns in the West and South with strong local economies and plenty of room to grow. In response to the criticism, Democrats announced they would tighten the bankruptcy provision so that it would only apply to subprime borrowers who can prove that they can't afford the current mortgage and permit bankruptcy judges to reduce interest rates to the prime interest rate plus a premium for lender risk. When the housing boom was reaching its crescendo in 2005, there were a few lonesome voices out there explaining that it was merely a symptom of a much larger, worldwide credit bubble. Between emerging countries in Asia like China and South Korea and oil-rich states like the UAE and Saudi Arabia, there was simply too much money sloshing around outside the U.S. in search of a decent return, and of course Wall Street was promising investors that it had stumbled upon the latest "can't lose" financial instruments: mortgage-backed securities. Nowadays we barely pause between such bouts of insanity. The dot-com crash of the early 2000s should have been followed by decades of soul-searching; instead, even before the old bubble had fully deflated, a new mania began to take hold on the foundation of our long-standing American faith that the wide expansion of home ownership can produce social harmony and national economic well-being. Spurred by the actions of the Federal Reserve, financed by exotic credit derivatives and debt securitization, an already massive real estate sales-and-marketing program expanded to include the desperate issuance of mortgages to the poor and feckless, compounding their troubles and ours. Bubbles are to the industries that host them what clear-cutting is to forest management. After several years of recession, the affected industry will eventually grow back, but slowly—the NASDAQ, for example, at 5,048 in March 2000, had recovered only half of its peak value going into 2007. When those trillions of dollars first die and go to money heaven, the whole economy grieves. The housing bubble has left us in dire shape, worse than after the technology-stock bubble, when the Federal Reserve Funds Rate was 6 percent, the dollar was at a multi-decade peak, the federal government was running a surplus, and tax rates were relatively high, making reflation—interest-rate cuts, dollar depreciation, increased government spending, and tax cuts—relatively painless. Now the Funds Rate is only 4.5 percent, the dollar is at multi-decade lows, the federal budget is in deficit, and tax cuts are still in effect. The chronic trade deficit, the sudden depreciation of our currency, and the lack of foreign buyers willing to purchase its debt will require the United States government to print new money simply to fund its own operations and pay its 22 million employees. The next bubble must be large enough to recover the losses from the housing bubble collapse. How bad will it be? Some rough calculations: the gross market value of all enterprises needed to develop hydroelectric power, geothermal energy, nuclear energy, wind farms, solar power, and hydrogen-powered fuel-cell technology—and the infrastructure to support it—is somewhere between $2 trillion and $4 trillion; assuming the bubble can get started, the hyperinflated fictitious value could add another $12 trillion. In a hyperinflation, infrastructure upgrades will accelerate, with plenty of opportunity for big government contractors fleeing the declining market in Iraq. Thus, we can expect to see the creation of another $8 trillion in fictitious value, which gives us an estimate of $20 trillion in speculative wealth, money that inevitably will be employed to increase share prices rather than to deliver “energy security.” When the bubble finally bursts, we will be left to mop up after yet another devastated industry. FIRE, meanwhile, will already be engineering its next opportunity. Given the current state of our economy, the only thing worse than a new bubble would be its absence. When granite countertops first came out, they were focused mostly in luxury homes and high-rise condos. When paired with stainless steel kitchen appliances, they presented a new design element that hadn't been done before. But when developers of condo conversions started putting in these same things en masse to imply "luxury," it became pretty evident that granite was becoming as commonplace as ceramic tile, thereby erasing what made it special. And with the premium for stainless steel appliances now all but gone, they're just another choice among several others. The granite countertop's glory days might be over. During the housing boom, updating a kitchen with high end materials like cherry wood cabinets and a Viking stove was a sure bet to boost a home's value. Homeowners often recovered about 80% of the cost when the house was later sold. NAR's survey revealed that returns on investment for a wide range of high-end interior redecorations dropped in 2007. An upscale bathroom renovation cost an average of $50,590, nationally, but only added $34,588 to house value - a 68.4% return. In 2006, a high-end bath renovation returned 77.4% of its cost. A separate report from the AIA also found demand for luxury features waning in 2007 according to the AIA. The popularity of high-end appliances declined from 65% to 47%. Demand for larger pantry spaces went down from 64% to 51% and wine refrigerators fell from 53% to 49%. Because even a great wine can taste ordinary when you've had too much of it. Federal Reserve Chairman Ben S. Bernanke told Congress today that nearly every corner of the U.S. economy was in danger of running into more trouble, suggesting that Americans were in for a period of tough economic sledding. He signaled that the central bank was likely to cut interest rates further when it meets again next month. The fact that the Fed chairman would be talking about still more rate cuts in the face of elevated inflation is a measure of just how deep a quagmire in which the economy has landed, with a slump in the housing market, recurring freeze-ups of the financial markets and slowdowns in consumer and business spending. About the only bright spots that Bernanke managed to find were that manufacturers' inventory of unsold goods, which often rise in recessions, were within well within bounds, and that most companies outside of banking and finance remained in "good financial condition with strong profits, liquid balance sheets and corporate [borrowing] near historical lows." "The economic situation has become distinctly less favorable" since last summer, Bernanke told lawmakers. As the Bush administration and Congress consider proposals to ease the home foreclosure crisis, local governments across the country have been lending money to imperiled homeowners and confronting some opposition. What some people don't understand is that our society is based on continuously bailing out people for thoughtless behavior and bad decisions: it's part of the cost for living in a society such as the U.S. Simply put, we have a social safety net that helps out the less fortunate as well as the idiotic. It's not necessarily fair, but it's the system we have in place. For example, we all pay higher car insurance rates to pay for fraud and those without insurance. We all pay higher insurance for medical care because hospitals are generally obliged to treat those without enough -- or any -- insurance. We pay higher drug prices than most other countries so drug companies can continue to invest in research (as well as lobbyists and friendly lawmakers who want to remain in office so they can be around long enough to reward the drug companies for their donations). We pay higher taxes so that some people can receive welfare and food stamps and Aid to Mothers with Dependent Children. Many of these people have also made thoughtless decisions -- should we punish them too by withholding their assistance and replacing it with a stern lecture? Some of these dissenting homeowners also don't understand that a foreclosed home across the street from them has a domino effect: first, it impacts the value of their home. Next, it makes it harder for them to refinance or sell (or move to take advantage of a new job). I'm predicting a bail-out from the federal government that will truly anger a lot of people. But that's the system we have -- sometimes we just protect people from themselves. There were signs of spring last week in housing, with home-builder sentiment and home construction showing glimmers of improvement. But two developments -- tightening lending standards and a surprisingly mixed interest-rate environment -- suggest a real thaw is far from near. In December, Fannie Mae began demanding bigger down payments from borrowers in housing markets where prices were declining -- which would describe every one of the 20 biggest U.S. housing markets tracked in the S&P/Case-Shiller home-price index. Freddie Mac says it wants to be compensated for the risk of taking on a mortgage -- setting the lending bar higher to keep defaults low. If it didn't do this, Freddie says, it could be forced to take on more capital, reducing the amount of money available to finance new home purchases. "We're in one of the worst housing-market reversals in 80 years, and that's going to have an impact on credit risk," Mr. German said. "We're going to have to align our fees with the real risks in the marketplace." Meanwhile, the Federal Reserve's rate-cutting efforts are having a mixed effect. The three-month London interbank offered rate has come down significantly thanks to Fed rate cuts. That is a boon to many borrowers whose mortgage payments shift with Libor. The average five-year adjustable-rate mortgage interest rate on "conforming" mortgages, those that Fannie and Freddie are allowed to buy, has fallen to 5. 57% from 6.43% when the Fed began its credit-loosening campaign in September, according to HSH Associates, a Pompton Plains, N.J., publisher of mortgage-rate data. This week will bring a barrage of housing news, including reports of preowned- and new-home sales, along with S&P/Case-Shiller and Office of Federal Housing Enterprise Oversight home-price data. Also due out are earnings reports from Freddie Mac, housing-focused retailers Lowe's and Home Depot, and home builder Toll Brothers. Each of these numbers is expected to move in the wrong direction: lower. Despite the Fed's efforts, in other words, there is really little reason to think the sector is near a clearing from this storm. It looks to me that the Fed just doesn't have the power to fix these issues, and that another type of government intervention will be needed. I don't see how we're going to avoid some type of government bail-out, especially in an election year. Politics generally seem to trump everything else in the U.S., perhaps including angering those who rent and those not at risk of foreclosure. Back in the 1970s, the dreaded economic trend was "stagflation," which meant a stagnant economy coupled with rising inflation. By the early 1980s -- when mortgage interest rates were in the double digits -- the "misery index" became a new number to track, which combined unemployment rates plus inflation. Inflation is really worse than recessions because its impact is much longer-lasting; to break its back in the early 1980s, then-Fed Chairman Paul Volcker continued to hike interest rates -- over 19% for federal funds in 1981 -- to tame inflation for the long term, although it seems that Reagan gets most of the credit for it (and all he did was re-appoint the guy in 1983) while Jimmy Carter got the blame. From a high of 13.5% in 1981, Volcker managed to lower it to 3.5% two years later. I don't think I could've done it any better myself! Two worrisome trends for the economy — falling house prices and the rising cost of everything else — picked up speed in data reported on Tuesday, putting policy makers in an increasingly tough position. A leading index of home prices in 20 cities fell by 9.1 percent in December from the same month a year ago. Using a three-month moving average, the index, the Standard & Poor’s Case-Shiller, is falling at an annual pace of more than 20 percent. The index tracks repeat sales of single-family homes; it does not include condominiums. Another government index of home prices that covers more of the country but does not include loans above $417,000 fell 1.3 percent in the fourth quarter, after falling 0.3 percent in the third quarter. The index, compiled by the Office of Federal Housing Enterprise Oversight, showed prices declining in all states, except Maine. “February may go down in history as the month that the previously indefatigable U.S. consumer finally threw in the towel, beaten by a combination of deteriorating labor market conditions, surging prices for food and energy and collapsing house prices,” Paul Ashworth, a senior United States economist at Capital Economics, wrote in a note to clients. Economists say home prices will remain under pressure for much of the next year or longer because the supply of homes for sale remains high. It has also become harder for home buyers to get mortgages as rates have risen and banks have become more conservative in demanding bigger down payments and more proof of income than they did during the housing boom. In many parts of the country, specialists note that home prices remain too high based on affordability calculations made using incomes and interest rates. A recent report by analysts at Credit Suisse, the investment bank, said that prices in some metropolitan areas like Phoenix, Miami and Los Angeles would have to decline by 20 percent to 40 percent more than they have already fallen for home affordability to be restored to its long-established level. What they DON'T mention is that prices to rent have also escalated sharply over the past 5 and 10 years; certainly not at the same level that home prices did, but enough to make investment properties pencil out at a higher level than median incomes alone would indicate. 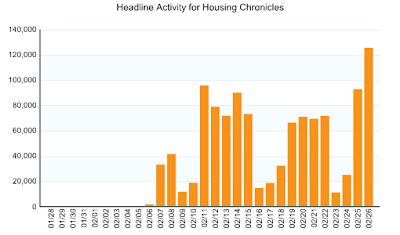 Since signing up with the blog syndication service BlogBurst on February 5th, Housing Chronicles has just passed 1 million headline views for the media companies subscribing to the service. Most of these views have been on the Reuters website (nearly 1.05 million alone), with the balance on the websites for Fox Business News and the Chicago Sun-Times. Thank you BlogBurst, for an impressive deployment of a great idea. Looking forward to being syndicated to even more of your subscriber sites! Robert Shiller, Yale finance professor and author of the highly touted "Irrational Exuberance" book on asset bubbles, said gradually falling home prices are nothing to fear. It's the more swift and sharp slide that can undermine housing, and thus consumer confidence and the economy, he said here at a Reuters Housing Summit. "There's nothing troubling about a gradual correction of home prices. If we keep our incomes at the current level and home prices go down we are richer, we can buy more housing," Shiller said. "We want a gradually declining market, we don't want a collapse in our institutions," Shiller said. "The purpose of this should be to try to maintain confidence, which is a dangerous thing to lose, and we want to also maintain a sense of fair dealing, that we're a society that cares about its people," he added. The subprime mortgage meltdown spawned a much broader housing downturn, but it has hurt many low-income people, many of whom were taken advantage of by lenders. 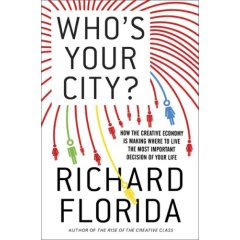 "In major cities, we see often the service people can't live there any more, the firemen, school teachers. This is not the way we want our society. We want affordable housing," he said. Shiller said it can't be all or nothing, and that there has been a big misperception that houses will constantly appreciate. "Some times people will try to imagine that we can have both high home prices and affordable housing. But I can tell you that doesn't add up," he said. "You either have high home prices or lower home prices and lower home prices are what we want, and people shouldn't be afraid of that," said Shiller. "Most of us care about our children and grandchildren, and these people have to buy houses so why would we want high home prices. We want economic growth, we don't want high home prices." The Northeast had the steepest declines in January, with sales falling 3.6 percent. Sales dropped 2.1 percent in the West and 0.5 percent in the South, but rose by 3.4 percent in the Midwest. Lawrence Yun, chief economist for the Realtors, said he believed the housing market may be on the verge of bottoming out with a rebound expected to start toward the end of this year. "Subprime loans and other risky mortgage products have virtually disappeared from the marketplace, and over the past five months, this has been reflected in soft but fairly stable home sales," he said. He said he expected demand to be bolstered in coming months by the action of Congress in the economic stimulus bill to raise the caps on the size of loans that can be backed by Fannie Mae and Freddie Mac and the Federal Housing Administration. I'm very pleased to report that the first blog posting I've submitted to the Carnival of Real Estate (a weekly compilation of submitted blog postings hosted by different real estate blogs each week) has been given honors as Top Post of the week by the Nubricks.com blog for the carnival's 79th edition. Nubricks.com is an online overseas property resource for unbiased international real estate news, pre-launch property deals, and timely expert advice for investing abroad. Since it seems that any potential remedies offered by the federal government to address the frozen market for home sales and mortgages could take months to have a large impact, both builders and existing homeowners stuck with unwanted inventory have, by necessity, become much more creative. From housing swaps, auctions and providing insurance against pricing declines to leveraging unused home equity with reverse mortgages or offering hard money property loans, some sellers and buyers are finding that a little ingenuity can sometimes trump a market in paralysis. The goal here is to bring together the best real estate bloggers from around the country (and world) to share information about what we’re all passionate about: real estate. This is intended to be a forum for everyone to participate. Like a potluck, everyone brings something and may the best dishes be recognized each week. The Zillow Blog Team — well, actually one very tuned-in guy on the team — was pondering the existence of Blog Carnivals for everything from “street poetry” to cats, but there was not one for real estate. Obviously, we were amazed by this realization. No Carnival for real estate? This must be fixed! So, we at Zillow thought, “Why not create a Carnival of Real Estate?” And so, we did. And I'm glad they did! I'm thinking of taking some ideas from this blog post and pitching them as potential stories for media such as the L.A. Times, and for that I'd really like some input. Are housing swaps working? How about auctions? Interest-rate buydowns or price guarantees? Hard money mortgages? What is working in today's market to allow some movement in the marketplace? Please send all suggestions to me at pduffy@metrointel.com. Thanks in advance! One of the biggest challenges facing the ongoing redevelopment of downtown L.A. is its sheer size: it dwarfs the downtown areas of many other cities also undergoing revitalization efforts, including Long Beach and San Diego. Consequently, its redevelopment efforts have been a bit spotty and generally focused in specific areas such as South Park (including and surrounding the Staples Center, et al) and Bunker Hill (Disney Hall, The Music Center and the proposed Grand Avenue project). More than a third of the approximately 110 residential projects proposed for downtown -- including the 50-story Zen tower on 3rd and Hill streets, the Mill Street Lofts in the industrial district, the multitower Metropolis off the 110 Freeway and the conversion of the former Herald Examiner building -- have been delayed or put on hold amid the rocky real estate market. Yet downtown boosters and urban planners are focusing most of their angst on two mega-projects: the Frank Gehry-designed Grand Avenue complex on Bunker Hill and Park Fifth, which would be the tallest residential complex west of Chicago. Though the area has seen an influx of loft dwellers over the last decade -- the population has doubled to 34,000 -- many urban planners see it as a work still very much in progress. Even the most ardent of downtown supporters agree that the area has not yet reached a critical mass -- in part because most of downtown's rejuvenation is occurring in pockets rather than across the entire zone. New downtown dwellers still complain about a lack of shopping and that for every newly vibrant street, there are others that still seem dead. The high-end retailers that downtown boosters would love to have in the city center have kicked the tires but still not agreed to put stores there. Grand Avenue and Park Fifth are seen as crucial because they would bring a new kind of retail -- upscale hotels, gourmet markets, fancy gyms and boutiques that are usually found in high-end malls -- to downtown. The $2-billion Grand Avenue plan calls for building shops, condo towers and a boutique hotel -- as well as a civic park -- on city and county land near the Walt Disney Concert Hall downtown. The project, now being called "the Grand" by its developer, was originally set to begin construction last fall but was delayed -- and then delayed again. Groundbreaking now is projected for this summer. Bill Witte, chief executive of Related California, the developer, said the delays in starting construction were more a result of the time it took to develop designs with Gehry and get approvals from government agencies for the developmentthan of the credit crunch. In addition, Witte said, a lawsuit by Peter Zen, owner of the Bonaventure hotel, sidelined the project's start date by some months. Zen's lawsuit, which was eventually settled, argued that Grand Avenue would violate a previous downtown redevelopment plan by adding too many housing units in the area. Neither party can discuss the terms of the deal. But some real estate experts are skeptical, saying the downturn in the economy -- and the falling real estate market -- is making investors skittish about huge new developments. The question is whether downtown can persuade those buyers to take a chance on the fledgling neighborhood. The area might get an answer in coming months with L.A. Live. It's moving forward without the delays that Grand Avenue and Park Fifth have encountered. L.A. Live, which opened its first phase -- the Nokia Theater -- last fall, will eventually include a hotel-and-condo tower, the West Coast headquarters for ESPN, restaurants and a multiplex. The condominiums, being marketed as the Ritz Carlton Residences at L.A. Live, are selling for at least a million dollars each -- and as much as $1,000 a square foot. L.A. Live has been boosted by the activity and growing street life around Staples Center. Grand Avenue hopes the nearby cultural attractions of the Music Center and the Museum of Contemporary Art can similarly enhance that project. "We remain very bullish about this," said Witte, the project's developer. "Especially when times are tough, it's very important you have a story to tell."